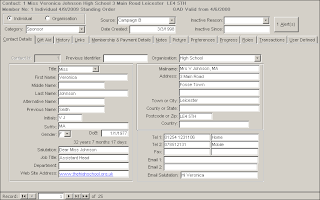 Can you get a decent fundraising database system for a small charity for just £100? Well, if you buy KISS Contacts then by and large the answer is “Yes”. It isn’t as rich in functionality as your Raiser’s Edges, ThankQs and IRIS’s, it may not be the most beautiful system, and it’s unlikely that it is the most appropriate system for more than a few simultaneous users or tens of thousands of records, but that is not its market. It’s primarily appropriate for small charities and membership organisations who need a quick, simple dedicated fundraising/membership database and for that sector it offers a good deal. 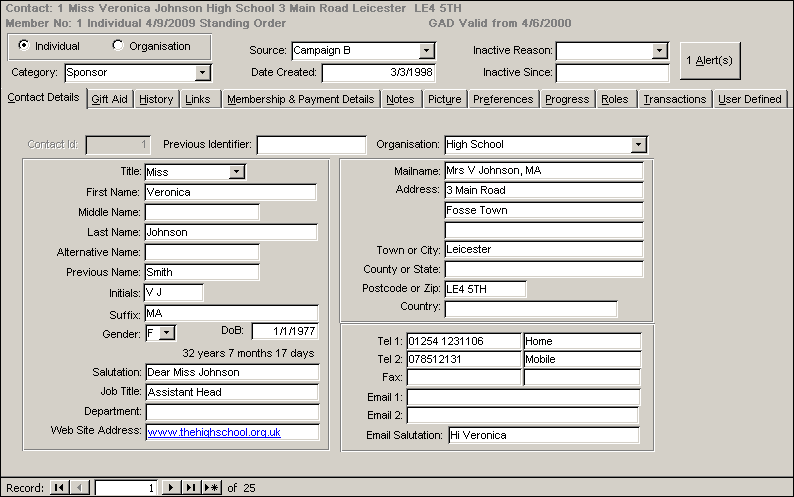 The first thing you’ll want to see is the main contact screen, and although it’s quite busy and small (KISS is written in Access 2000, but that does mean it will run and look fine on older PCs), you can record lots of information. All your standard contact details, income, contact history (I like the fact you can see phone calls, emails etc and donations on one screen), links to other contacts, mailing preferences, notes and even a certain number of user-defined fields. In terms of income, you can of course record your standard donations and allocate them to funds and state a source of the donation, but you can also manage standing orders and even direct debits; that’s pretty impressive for such a cheap system. And you can record Gift Aid Declarations and manage Gift Aid claims. If you’re a membership organisation, then you can manage your membership in KISS. You can define membership types, produce renewal and ‘chaser’ mailings and show late payers. And the memberships can be linked to the payment method. You can only have one membership per contact, but for most small organisations that is probably not going to be an issue. But no system is worth much unless you can get data out and KISS can do that too: mailings, labels, reports and data export. It is a bit limited in terms of the record selection functionality but it can still do comparatively simple selections. It has a series of useful, pre-defined reports and you can also export the raw data so you can do further analysis outside the database if you wanted to (i.e. in Excel etc). And because it uses Microsoft Access, you could write your own reports in your own copy of Access, Crystal Reports etc by linking to KISS’s back-end database. It even has a built-in Help system and a limited audit to show historic changes to some of the key fields on the system. What doesn’t it have? There is only one login name so you don’t have different levels of security (although I understand this is planned for a future release); you can email multiple contacts at one time but you can only do this directly from KISS by using Outlook’s blind copy (“BCC”) method (although you could export email addresses and use dedicated mass email marketing software); the record selection/query system is not as sophisticated as you would get with more expensive databases and you can’t do ‘ad-hoc’ queries on any field; there is no event management functionality (although, again, this is planned for the future); and because it uses Microsoft Access, you can’t run it across multiple sites/locations unless you use something like Terminal Services (but plenty of much more expensive fundraising packages have the same issue). And, as I stated before, the screen design is showing its age, with fields tucked tightly into forms and not using the whole potential of larger screens. I understand from KIS that they are planning to move the software to Access 2007, so this may help the look-and-feel. But all of those issues are comparatively tough criticisms on such a cheap system and for most small charities, they probably wouldn’t matter too much. I think, because KISS uses Access 2000, there could also be the potential for some conflicts if you are also running other versions of Access on the same PC. This may be a good reason to use KISS’s runtime version of Access 2000 which comes with the product. Again, the potential move to Access 2007 should help this. As an organisation, KIS Software Solutions can only offer support via email and online support forums, although there is of course the built-in help system too. KIS feel that for many installations, charities should not need training, or rather you can self-learn the system, and I probably concur as long as you have some experience of using a database or you are data savvy. But they do organise training for clients who want it, or those who want advice on setting up the system, especially where the database is networked. The system is also limited in structure and screen design to pretty much what you see (with a few neat tweaks here and there). But actually, because there is only so much you can do with it, it won’t require a steep learning curve, costly configuration or an expensive implementation and that certainly is a benefit for small charities. In terms of alternatives, I would expect it to mostly compete with a few other similar, low-price databases or where a charity is considering writing its own database in Access or Filemaker etc. For the latter, KISS wins hands-down; why spend months and money on re-inventing the wheel when KISS does so much of what you would want from a fundraising database already? Some charities might also consider the more recent adoption of web-based solutions such as SalesForce, Microsoft CRM, CiviCRM et al, and those solutions do offer more flexibility, customisability, a better look-and-feel and a web interface; but if it is mainly fundraising or membership functionality you are after then you would certainly spend plenty of time configuring the above systems to achieve some of the specific functionality you get in KISS. If you are a small charity or membership organisation and you need a simple, solid fundraising/membership database to support your operations, then KISS should certainly be on your radar. For £100 it is truly excellent value. For details on how to contact KIS, visit KIS Software Solutions' web site.